Preheat the oven to 375°F and set a large pot of water on the stove top to boil. Cook the manicotti in boiling water for 1 minute. After they’ve cooked for 1 minute, remove the pot from the heat but do not drain the manicotti squares in a colander as the noodles often stick together. Instead, run cold water into the pot until you can fish the manicotti squares out safely with your fingers. Shake off the excess water as you remove each square. It is usually best to place the squares on a clean cloth to further blot them. Lay the squares flat on a cloth, placing the filling across the center of the dough, leaving a little room at the edges on each side. Turn up the edge nearest you so that it lies on top of the filling. Now turn the edge farthest from you toward you so that it lies on top of the first edge. You now have a cannoli-like tube. Spread one ladleful of the sauce onto the bottom of a 9 x 12-inch baking pan. 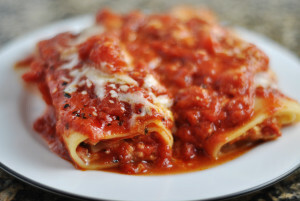 Turn the manicotti over and place seam side down in the baking pan on top of the sauce. Continue until the pan has a layer of manicotti. Spoon two more ladlefuls of sauce over the top and bake for 45 minutes. Remove from the oven and let sit 10 minutes before serving. Serve with additional sauce for individual servings.